Dynamic Instruments is a specialist company in the medium and low voltage instrumentation energy and power sector. We operate in a highly skilled, specialized and technical industry. As a result, we pride ourselves in being an accredited Construction Industry Development Board (CIDB) member with CRS Number 14-55-90 with supporting CIDB Grade 9EP. With more than 20 years sound experience in delivering consistent quality design, construction and effective maintenance of infrastructure for electrical energy and power, we are your dynamic leader in supporting your objectives in providing energy and power. Our value is designing, supplying, manufacturing and installing low voltage, medium voltage lighting, small power control instrumentation, fire detection, CCTV intercom systems, concrete core drilling and panel manufacturing products and services for you. We are your leading cabling implementer as well as providing and installing transformers. We have extensive experience in refurbishing outdated energy and power infrastructure. Our experience is continually called upon as borne out by our references. 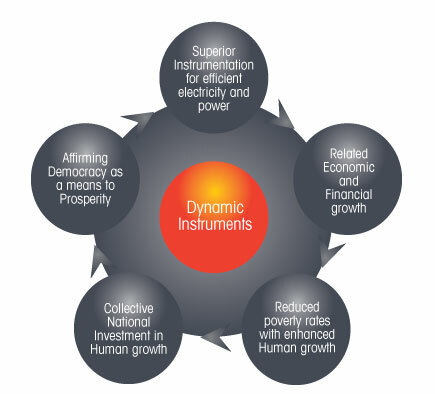 Dynamic Instruments vision is to be the ideal in providing hope for others and ourselves through integrity, honesty and sound principles in providing infrastructure for electricity, power and energy providers. We envision that we will always be your lead partner in supporting your efforts to provide sufficient electricity, power and energy to keep nations growing. Our categorical mission is to assist our continent, our country and its people to grow with the provision of dynamic energy, electricity and power. Our driving mission, short- and long-term, is to invest in the growth and prosperity of our country and its people. Our ultimate mission is to invest in the energy and growth of our country by expanding and investing our specialized knowledge and skills in the mining and petroleum industry. Dynamic Instruments’ ideal for ourselves is that we will do everything that we do with integrity, with honesty, with principles . We value professionalism. And the customer is always the most important link in the dynamic chain. Our ideal for our people and our country is that we will always have enough electricity, power and energy to keep us growing into the nation we hope to be. Our core ideal is to preserve the precious commodities of power, energy and electricity. And our job is to keep these commodities dynamic, affordable and growing. For the sake of our country and its people.